Hi all, I thought that you might want a brief rundown on our trip to Panama. We left here on Sunday PM (11/09) and drove to El Segundo to the Hacienda Hotel to stay overnight, park our car and get shuttle service to LAX for an 0830 takeoff on Monday. We flew Delta to Atlanta where we had a couple hours of layover and then by another Delta flight to Panama City. We arrived there about 2100 and were met by a small bus, which picked up about 30 or so other tour members of the Elderhostel Tour who had arrived on our flight. 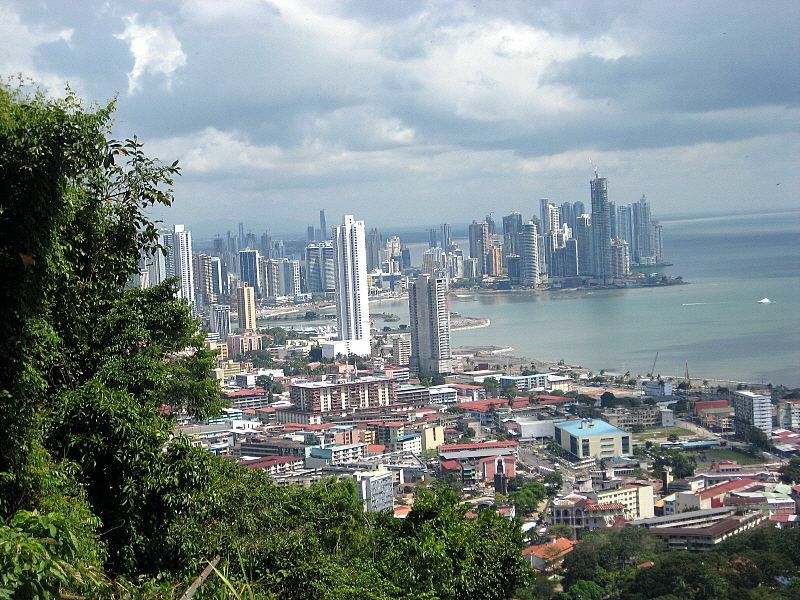 We were surprised at the large numbers of high rise buildings in downtown Panama City. The heart of the newer parts were quite modern. A 30 minute ride took us to a nice hotel right on the entrance to the Canal on the south, or Pacific side in the town of Balboa. The ride took us through some tougher parts of town which were run down and darkly lit. We looked out of our 3rd floor window the next morning to see a large number of ships anchored out in the bay awaiting permission to enter the canal and soon there was movement of a few vessels starting the transition across the isthmus. A buffet breakfast was followed by a general meeting to get acquainted with all the others on the tour, meet our guides and get an update on the schedule. 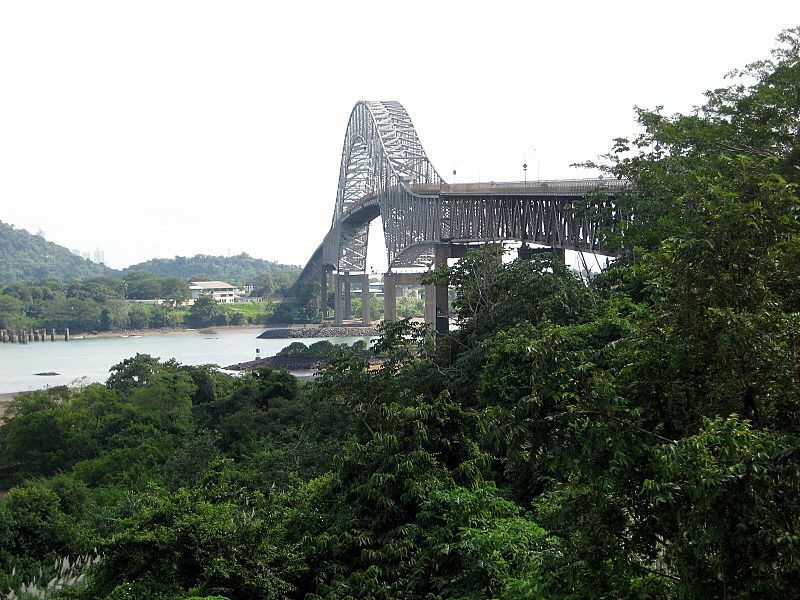 Shortly thereafter we were touring the old Canal Zone (now under the control of Panama) and the suburbs of Panama City. 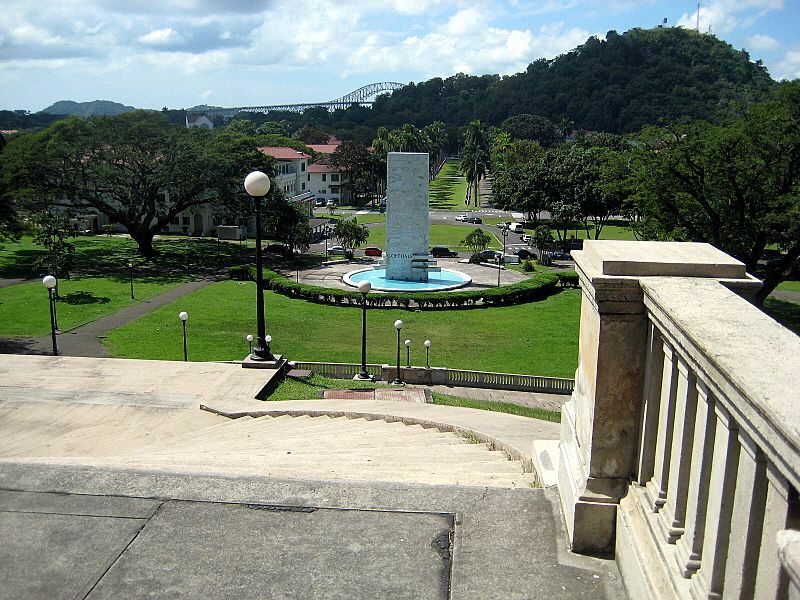 The Canal Zone stretched five miles each side of the actual canal and prior to the turn over to Panama was administered by the Canal Zone Authority and protected by the US Military (Army, Navy, Marines and Air Force). All of these US presences had large installations within the confines of the Zone. All of this has been turned over to Panama. The turn over process began in the 90's and was completed by 2000 (I think it was). Panama was a poor country at the time of the turn over and had to take on a big economic load when they assumed responsibility for the canal. True, they got the revenue from the canal; however, the rate structure imposed by the US government was probably only near the break even point with lots of the money coming from appropriations. 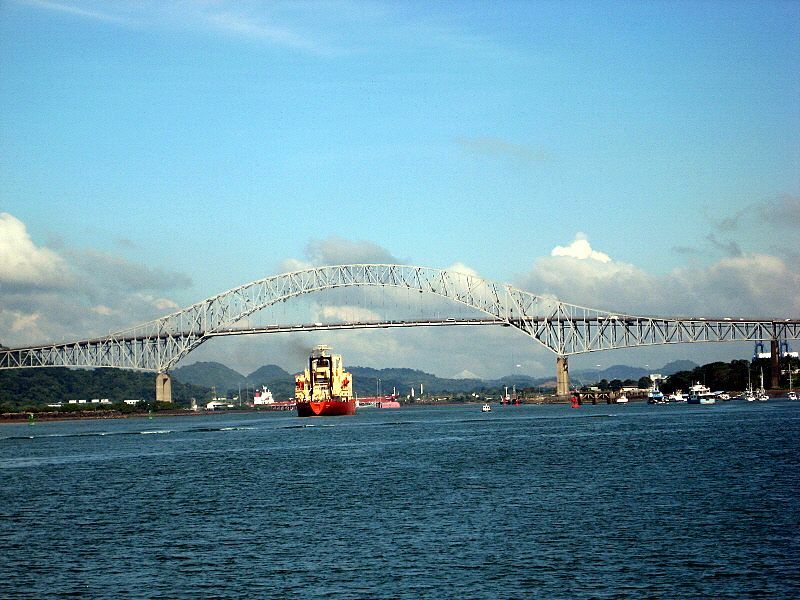 Panama had to negotiate treaties with other countries that used the canal to establish new rates for its use. These could not be jacked up to levels of reasonable profitability immediately, but had to be slowly escalated over a period of several years. The result can be seen in the dilapidated condition of many of the grand old buildings built before WWII. 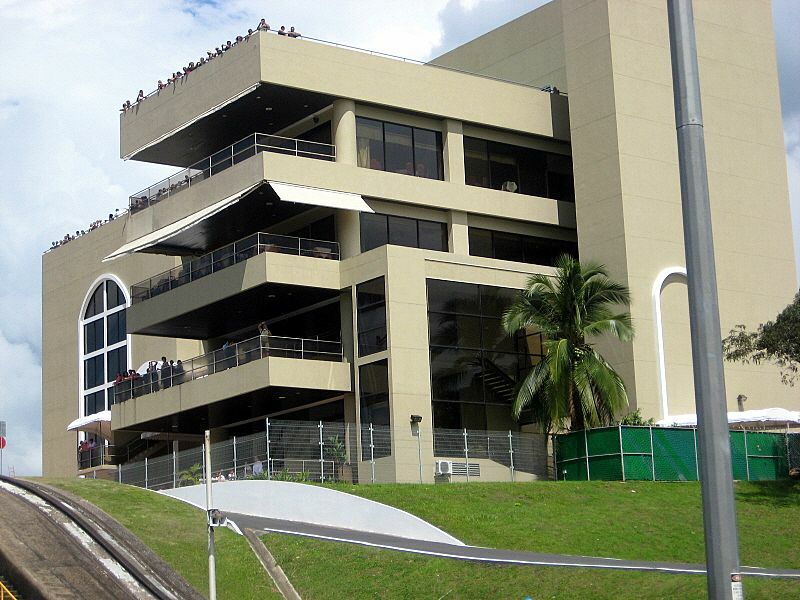 As the took over control, the Panama government had to find uses for the buildings (They do not have any military, only civil police force, for who would attack them knowing that Uncle Sam was watching?) Many of the admin buildings are still used for those purposes and the old hospital is still serving the same purpose. However, many of the buildings are "white elephants" and some are in the process of being torn down to make other uses of the land. some of these projects have stalled and the buildings in this case are in ruins and covered with graffiti. It is really sad to see, but I think that it will all work out over the next few years. Rulers such as Noriega had a large imprint on the conditions and things have vastly improved with his removal. I had not considered the differences in the ethnicity of Panama from all the other Central and South American Countries. While they all had a similar beginnings, their development after 1492 was quite diverse. With the coming of the Spaniards, everything changed. Panama had no gold, but others in South and Central America had gold and other goods desired by Spain. When the Isthmus of Panama was discovered early in the 1500's, the Spanish used it as a route to bring plunder from Chile to Central America, trek it overland and by boat down the Charges river to the Caribbean side for shipment to Spain. 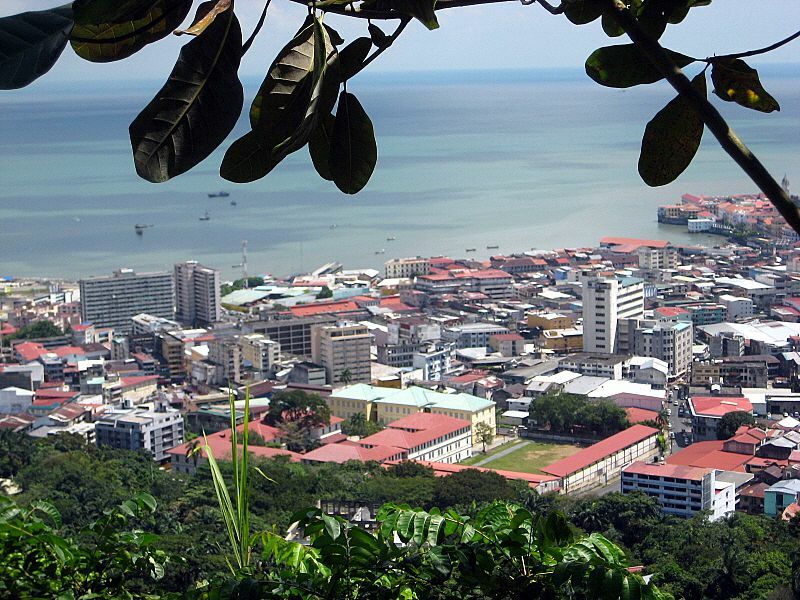 This established, very early, the importance of Panama. Spain engaged fortification engineers from Italy to design and build a large fortification on the Caribbean side where the Charges emptied into the Sea as a protection for the stored goods and the local inhabitants from invading pirates and England and France. Later even more fortifications were built. The overland trek in the very dense jungle was assisted by hacking a narrow but maintained pathway and covering it with stones of various sizes to keep the men and pack animals from sinking to their knees in the wet rain forest during the rainy season where annual rainfall measures about 200 inches! All of this activity caused the importation in the 1500's of foreign workers and slaves from Africa. In the late 19th century, when the French selected Panama to build their canal, they brought in more foreign laborers along with their own nationals. In 1903, the Americans continued to use what was available local for labor, but brought in many more from the West Indies, China and India. 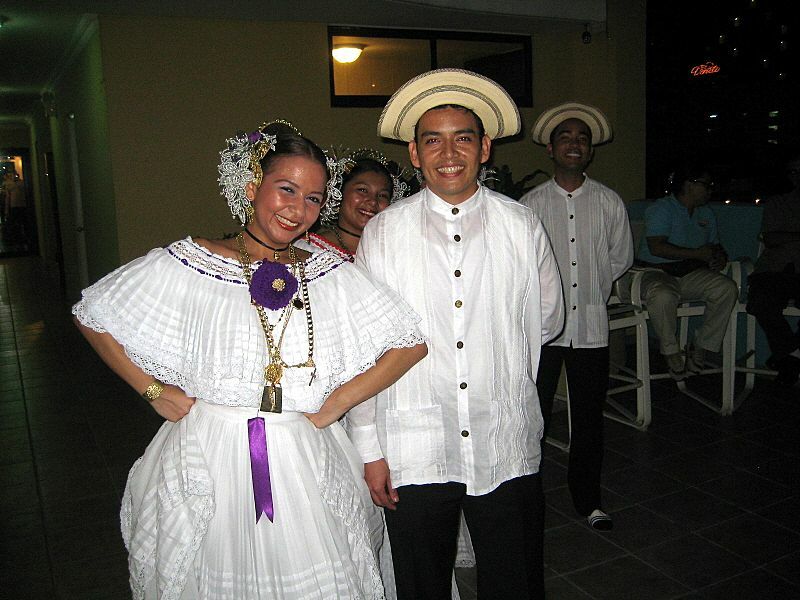 Today, Panamanians are of varied color and facial features with name that are representative of the melting pot that was formed there. One of our guides was named Archie Kirchman. He was Hispanic in looks, spoke good English with an Hispanic accent, but from his name had European blood possibly Dutch German or Norse. We spent three nights in Balboa seeing some of what was available there, museums, relating to the country and the canal. We ate at a restaurant in one new museum facing one of the locks where we watched ships of all sizes transit the canal. Food was good, but the flavors, to me, were a bit disappointing. The food was carefully prepared and presented and in large variety and quantity, but somehow, just didn't fit my palate. It was not real spicy,as in Mexico, but the flavors were just a bit strange at times. We encountered no food or water problems, since the water system in this part of the country was built by the US and apparently was well maintained. We left Balboa on a small old motor boat about 40 ft long. It was said to have belonged to Al Capone and used to smuggle booze from Cuba -- could have been! It took us about 9 hours to transit the canal. Sometimes we shared a lock with a large ship, but other times we were alone. We had a few showers, but we were in the transition to the dry season, so this was no big problem. 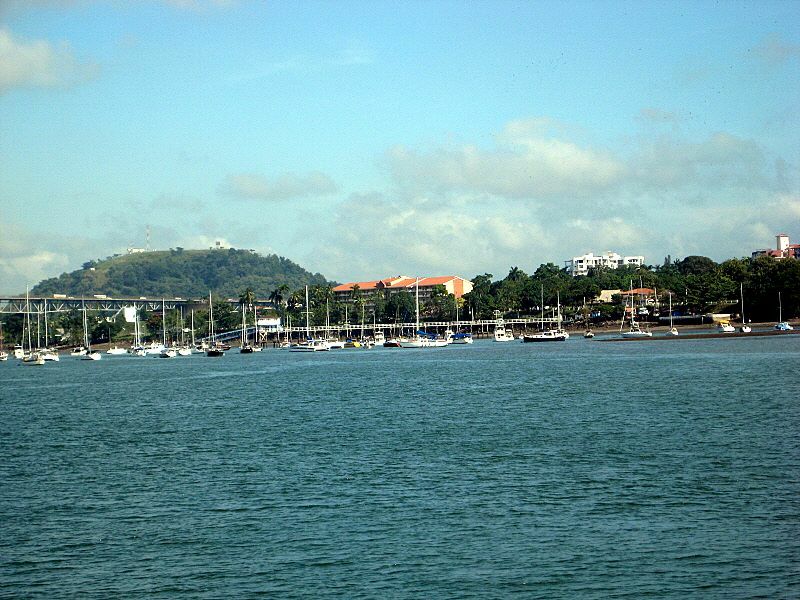 We stayed in Colon, the other former Canal Zone city built by the US on the Northern end. Colon has a population of 250,000, but oddly enough has no stop lights! Traffic is a bit disorganized and pedestrians mingle with the cars and fight for the right away. Our transit from boat to hotel occurred at rush hour and it was an amazing sight! 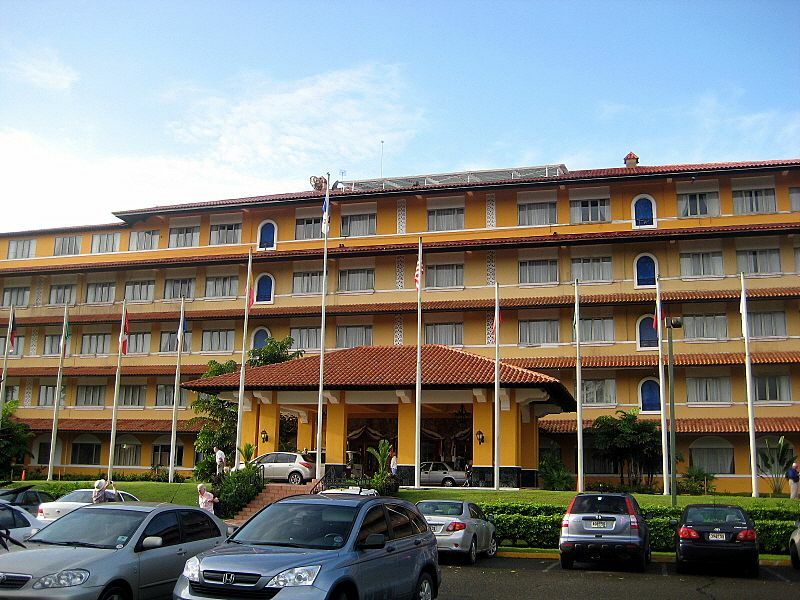 We stayed in a very grand hotel that had formerly been the site of the School of the Americas. 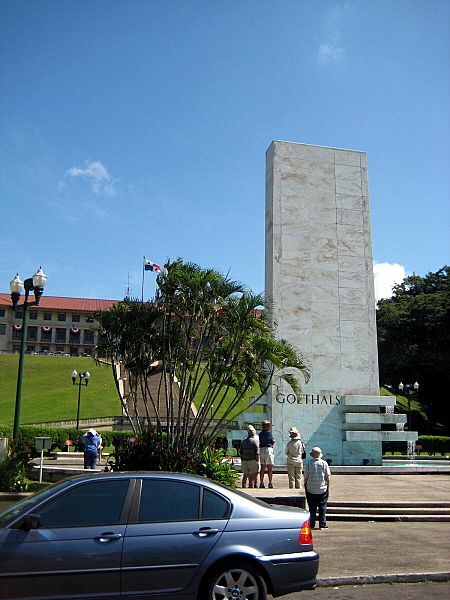 This is where the US Army trained Central and south American military officers. We spent a day exploring this end of the canal and taking a boat ride up the Charges river. It was a real jungle ride and we saw much wild life, mainly birds, monkeys and fish. That evening we returned to Panama City by the railroad. This railroad was built long before the canal and was used in the same way as the men and pack animals had been used in the 1500's. It carried cargo from one ocean to the other. It had been built primarily for the Calif. Gold Rush and was finished about 1851. Lately it was converted to passenger service. 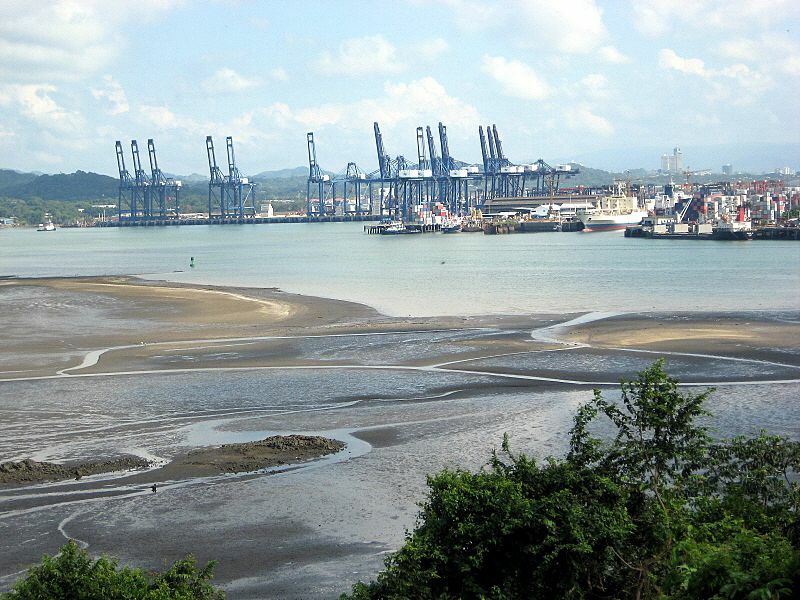 However, its main role is trans shipment of cargo containers. Ships on both ends, which do not wish or cannot transit the canal for any reason (size, cost, or routs to other S. American ports) can drop and/or pick up containers that have transited by rail. Our last night was spent down town Panama City in a very modern high rise hotel where we had our farewell dinner with local color entertainment (dancers). We were up the next morning at 0400 to catch our bus at 0500 for a plane which was scheduled for departure at 0830. The planes were all delayed for two hours for some reason, which meant that our connection to LAX was rescheduled. We had a lay over of two hours in Atlanta, which we felt comfortable about, but we hadn't counted on complications! The baggage unloading was terrible! One of our bags was lost and the other showed up about the time that our flight to LAX boarded. We had to first check through Immigration to show our passports, then get our bags, then turn our bags back in for the LAX flight then go through security, then go from Terminal E to Terminal A. By this time the flight had departed. We rebooked, but were told the flight at 1758 was full and we were on standby. However, when we checked a few minutes later to get boarding passes there were seats, but not together. We grabbed hot meal and went to the gate for a short wait. Then boarded. The plane had plenty of empty seats so Jo and I sat together for the 5+ hour flight against an 80 knot head wind. I had no idea which flight our bags were on, so check when we arrived at LAX. The computer said they were here and we found them - they had come on the flight that we had missed! Jo's bag was so badly chewed up that we are trashing it! It was a good tip and a good value for the money. They kept us busy, fed us well and provided very good lodging. I learned a lot and look forward to another Elderhostel in the future -- maybe next year depending how other event schedule. Hope this wasn't too boring! When I download my pix, I'll see if there are some you might like to look at. From the top of Ancon Hill, this would be the southern part of the city to the right of previous photo if the shot were panned. 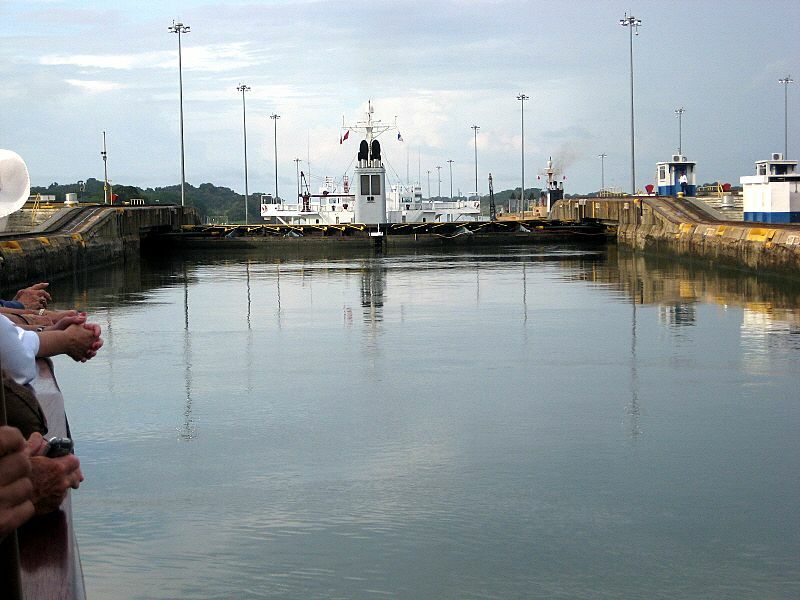 going through the first of the Gatun Locks dropping from the level of Gatun Lake to the Caribbean level. A large ship is one lock ahead and has already stepped down about 60 feet from our level. This building was formerly used by the US Armed Forces as a school for officers from all the Central and South American Republics. Here, since the and of WWII, these officers were taught subjects that were aimed at protecting their countries, hopefully reducing the chances of revolution and making them friendly to the US. This school was closed some time prior to when the Canal was turned over to the Pananamanians because of its cost, and some felt, an inappropriate political function. 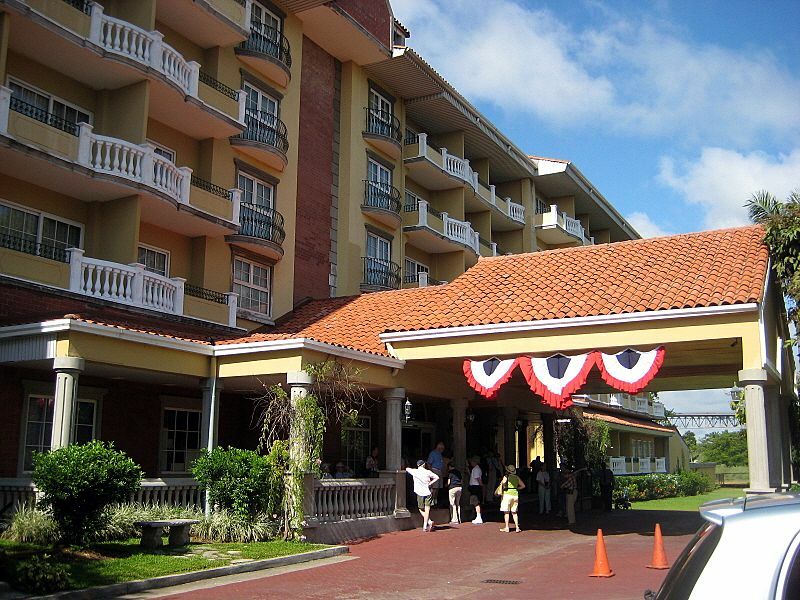 It has been renovated and remodel into a very plush hotel and one that I would not have associated with Elderhostel. 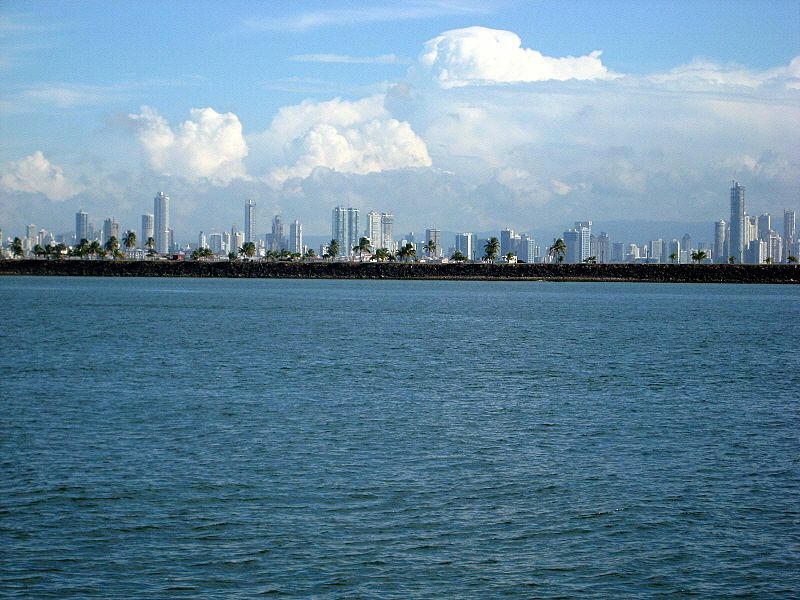 View of Panama City taken from the deck of the boat which took us through the Canal. view from the water level inside one of the locks. It is shot looking at one of the two massive steel gates which swing out of the walls and lock together in a relatively tight seal to make a giant bathtub in which to float large ships. A set of these gates separates the chambers of the locks in each of the sets of locks. 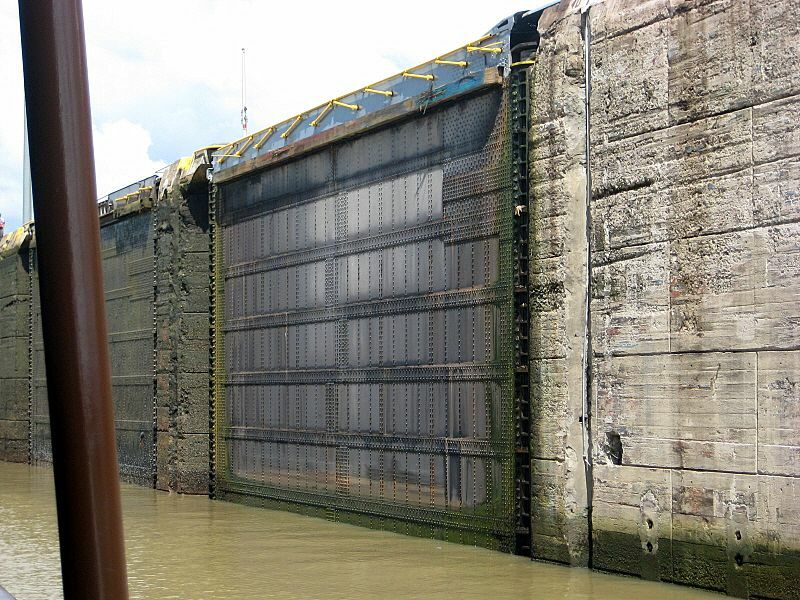 It requires three locks to raise a ship to the level of Gatun Lake and them three others to lower it on the other end. Note the relatively good condition of the cement forming the lock walls. Consider that this cement was poured over 100 years ago! It contains no reinforcing steel. Ex Howard USAF base is one of two such bases (the other is Allbrook) which served the military in Balboa from time of WWII. It is now a civil airport for commercial and private operations. Planes of "Commuter" and "Business" size use it for transportation within Panama and neighboring countries. 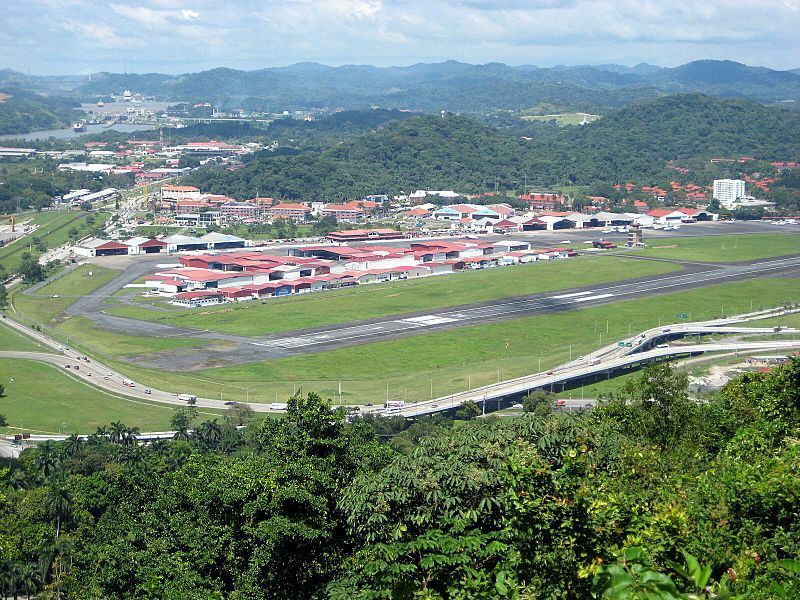 Large airline planes use the Panama City International airport. Four couples that entertained us at our farewell banquet in Colon. We were paired with a relatively short Reefer (refrigerator ship) when we went through the first set of locks. 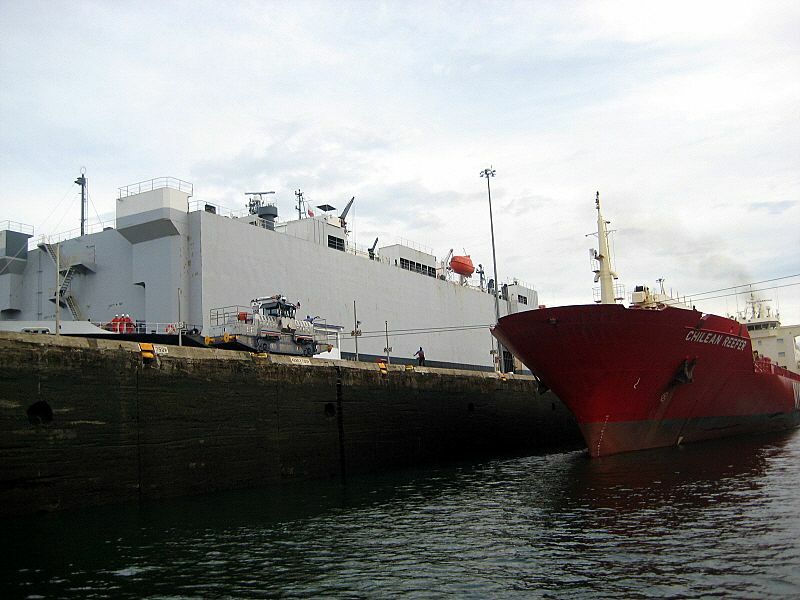 It is dwarfed by the massive Car Carrier which is known as a RO-RO, for Roll-On Roll-Off ship, since cars are not contained, but driven on and off under their own power. Paring of different sized boats economizes on the use of the fresh water which is used to float a vessel through the canal locks. 52 million gallons of water are required for each ship to pass through all the locks. Water is not conserved, but flows out to sea. If two ships go through together that saves 52,000,000 gallons of water! Plus it increases the number of ships that can pass through each day. A third set of locks are now under construction which will allow larger vessels to transit the canal, plus the water will not flow through, but will be conserved for subsequent use. At the time the Canal opened in1913, the largest vessel in use was a battleship which was probably slightly over half of what a PanaMax (largest ship through the canal) ship is today. In times of low water (from the El Nino effect) can result in fewer transits and reduction of cargo carried to reduce the ship's draft. 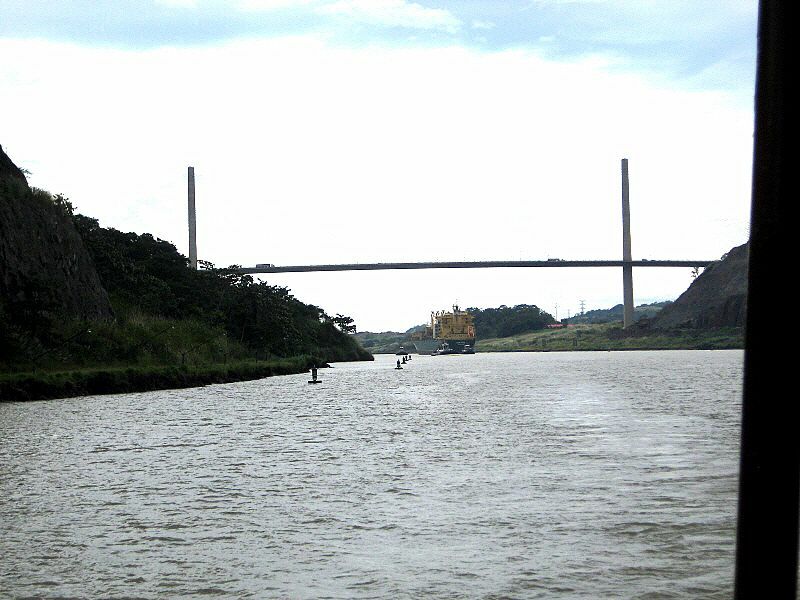 The first real bridge across the canal, the Pan American Highway bridge, connects to a road which can be driven from Canada to Colombia. Unfortunately, there is no through road from the Columbian border on through to Argentina. I always thought that there was! 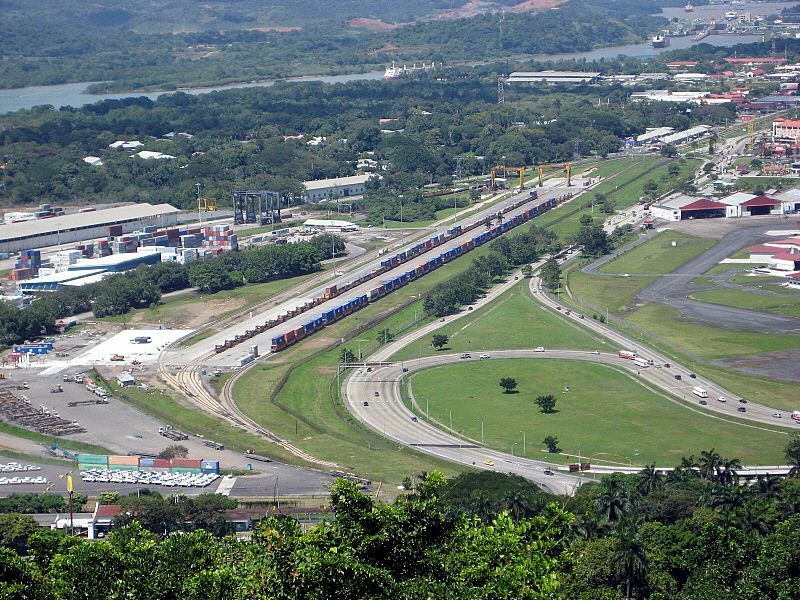 Containers offloaded from ship not traversing the canal are handled in this railroad yard and sent to an identical yard at Colon where they either terminate or are loaded on other ships for transport to Atlantic ports. This rail yard is adjacent to the Balboa Container Port. This is the "land side" of our hotel for three nights in Balboa. The water side was on the shore of the entry to the canal and ships and boats passed it continuously during the day. At night we watched from our balcony as planes circled and lined up for landings at Allbrook Field between us and Panama City. 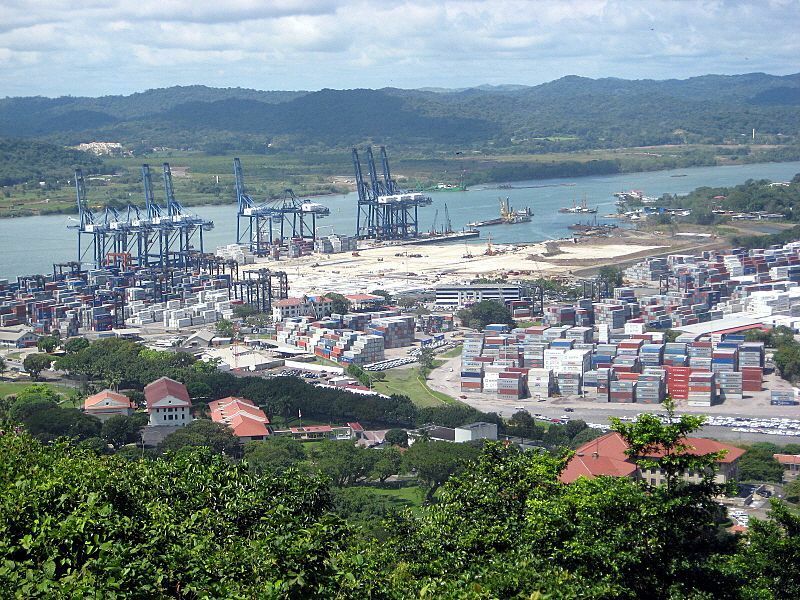 A view of the balboa container port from the west side of the Canal. We had just crossed the Pan Am Hwy Bridge. Note that the tide is out. The tide on the Pacific (south) side is about 18 feet, while in the Caribbean it is only about 3 feet. Another view of the container port. 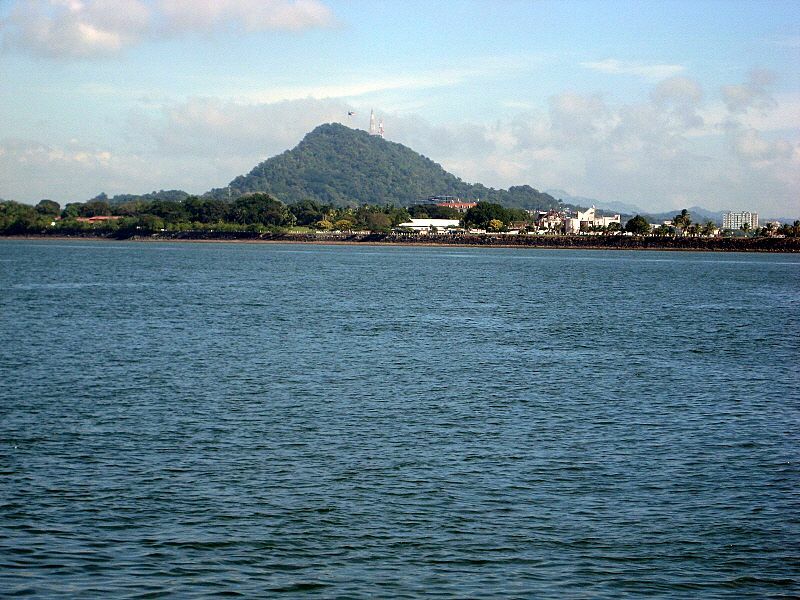 Ancon Hill provided a lookout during the early days prior to the Canal and even later. It was the site of stone quarries furnishing stone for the Canal construction. We drove to the top the first day of our tour. Its slopes are filled with housing for Canal employees and had military bunkers installed during WWII. Goethals Memorial as viewed from theAdministration Building. This new bridge spans the Culebra or Gaillard Cut. It is not far from the city of Balboa. Unfortunately, the spider-web of cables from the towers don't show up in this shot. Thanks, Tom for putting this on the web site for me.